Everyone gives the USA a hard time for their food. But are those huge portions of over-oiled sugary heart explosions really all the States has to offer? I hadn’t really been to the States properly before last year (stopping in transit at LAX doesn’t really count, does it?) I imagined huge brimming piles of unfortunate looking food swimming in yellowy brown oil and tasting of corn syrup. My mind was full of images of bright orange cheese wobbling like rubber while it coated greasy burgers the size of my head; I had nightmares of blubbery mac ‘n’ cheese, suspicious hotdogs and that dark mysterious persona that is grits. Thankfully, none of my food-mares came to be. Instead, I found myself very much surprised by the quality of the food and the service behind each meal. 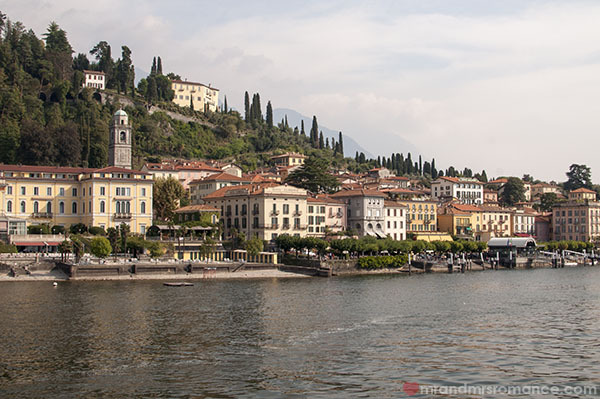 In fact several things we ate have made a special place in our hearts (not in a cholesterol way) – so much so that I keep thinking about them and what I’d give to be back there right now! I know Sullivan’s is a chain and I was also a bit drunk at this stage (hence the dodgy photo – sorry about that) but the blue cheese burger I had there that night has become the benchmark for all other burgers I try. It’s sadly a thing of legend now as Sullivan’s has taken it off their menus. Often the brightest sparks last the least time. It does still hold a place of honour though in my Top 10 Burgers of all Time. 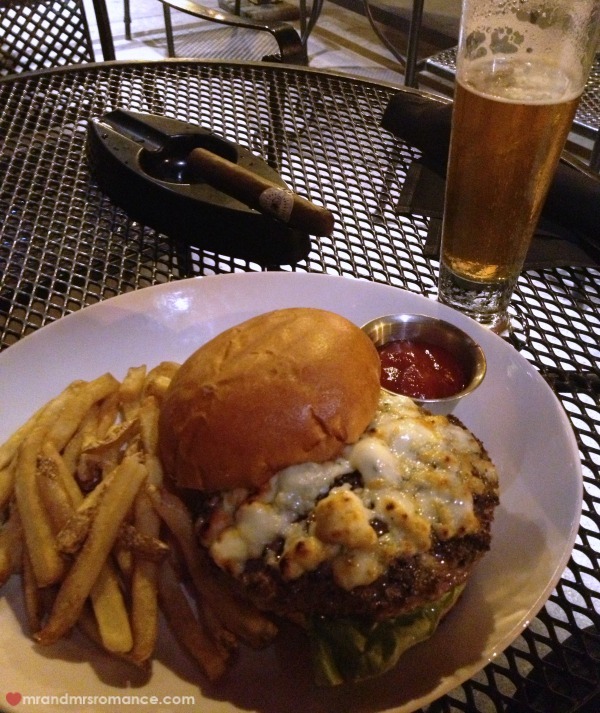 I went to Sullivan’s as part of my Chicago cigar bar buster, which was also lots of fun! The food in Momofuku is extraordinary. Everything we ordered (and we ordered a lot!) was superb but the pork buns were the best. 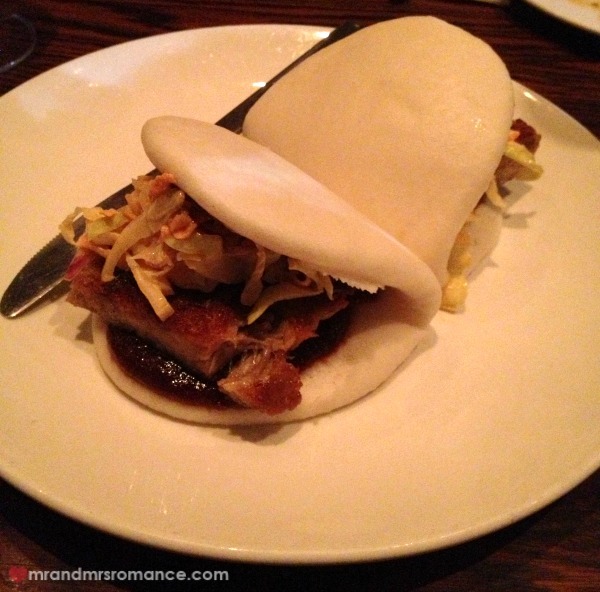 Soft, fluffy buns with thick slabs of perfectly cooked pork belly… sorry, I’ve just drooled on myself. For more info on Momofuku and lots of other things in NYC, check out our Ultimate First Timer’s Guide to New York. Incredibly touristy but nonetheless delicious, the cob clam chowder at Fisherman’s Wharf in San Francisco is genius. 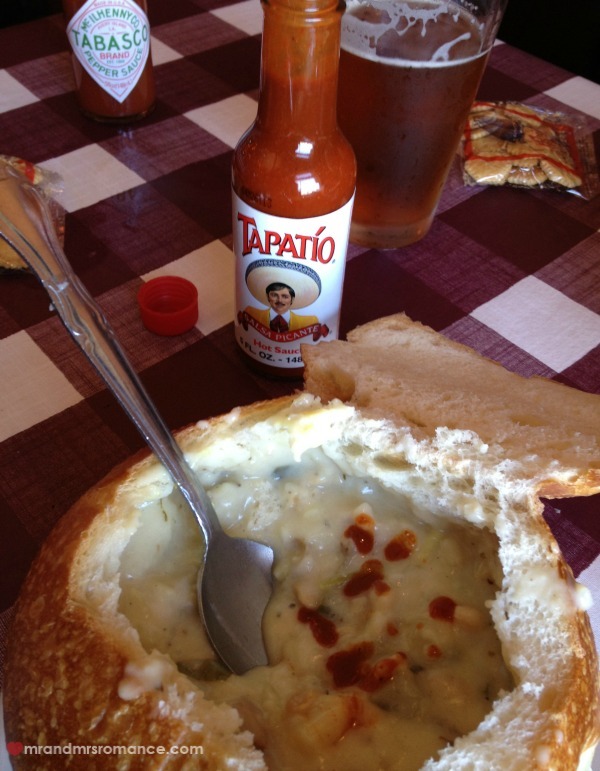 It’s creamy, clammy (in a good way) and the spicy sauce really makes the chowder zing. This was from Nick’s Lighthouse in the main street of Fisherman’s wharf. The place is crazy and needs a serious refurb, but it all adds to the charm. Being so close to Mexico, San Diego pumps out the best bloody burritos in the country. I’m pretty sure they’re different to the burritos you’d find in Mexico itself, but that’s okay. 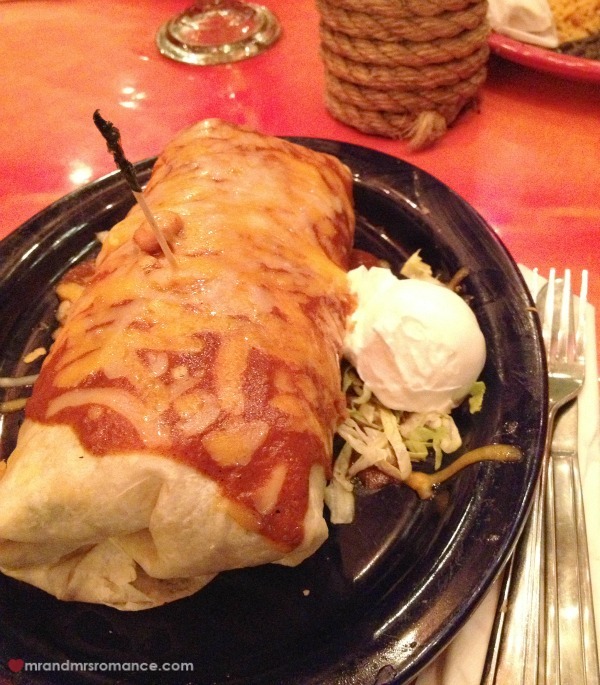 If you want to take things to the next level, go for the California burrito, which comes with fries inside! There are plenty of places to go for food in ‘America’s Finest City’. For more options, here’s our first-timer’s essential guide to San Diego. This is one of Mrs Romance’s favourite places in NYC. It’s a giant grocery store with little food court style delis and restaurants dotted around. It means you can shop and eat at the same time. Best of both worlds. And they’re all licenced! Upstairs on the roof – with views of the Flatiron Building and out across Manhattan – is Birreria. There’s usually a queue to get in but just put your name down and grab a snack. 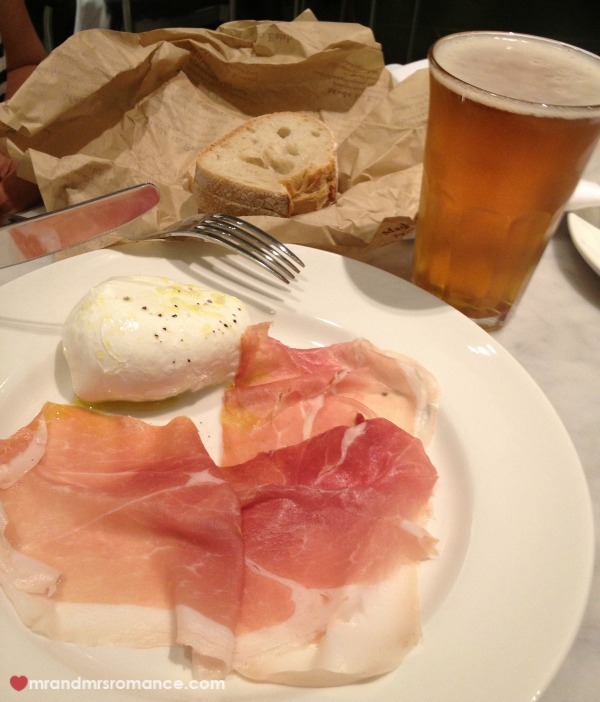 This prosciutto and fresh mozzarella was the start of a beautiful meal with some great beers. I love Chicago. I had a great time there and this restaurant was certainly one of the many highlights. 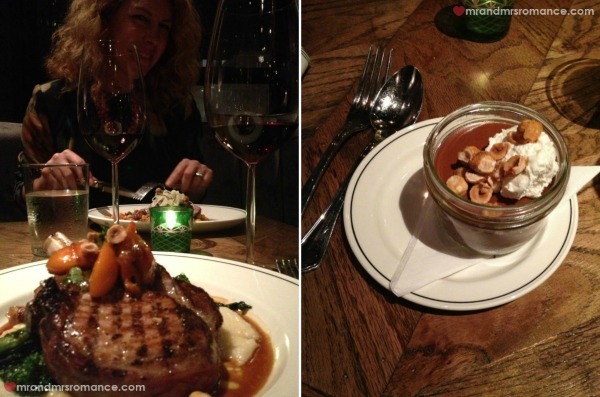 The food here is all terrific, the service is exemplary and the décor is impressive too. It’s also owned by a TV celebrity chef and sommelier, which is exciting, isn’t it? My on-the-bone Berkshire pork chop with pork belly and stone-ground grits (I still don’t really understand what this is) was awesome – as was all of my dinner in fact. Mrs R’s choc nut mousse dessert was great too. Our full review of The Boarding House is here. One thing I had to have while we were in the Big Apple was a proper New York pizza. 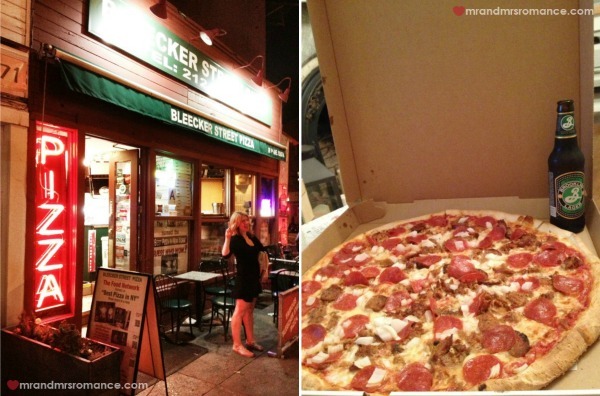 We found a little place called Bleeker Street Pizza which did us up this monster pizza. I hadn’t realised quite how big it was going to be until we went to collect it. I also hadn’t realised what a pizza pig I can be until I started scoffing! Along with their superb burritos, San Diegans have the luxury of being able to munch on awesome tacos – often going very cheap on certain nights – and carnitas, which are kind of like Mexican sandwiches. Mrs Romance and I ducked into the Barrios Star on 5th Avenue purely by chance. Mrs R’s fish tacos were great but my pulled pork carnitas (listed as carne asada torta) is incredible. Barrios Star also list ‘Morning Spirits’ and ‘Lunch & Dinner Spirits’ on their menu, which we thought was just about the best thing we’ve ever seen! It was our first day in Chicago and it had been a very late check-in the night before. 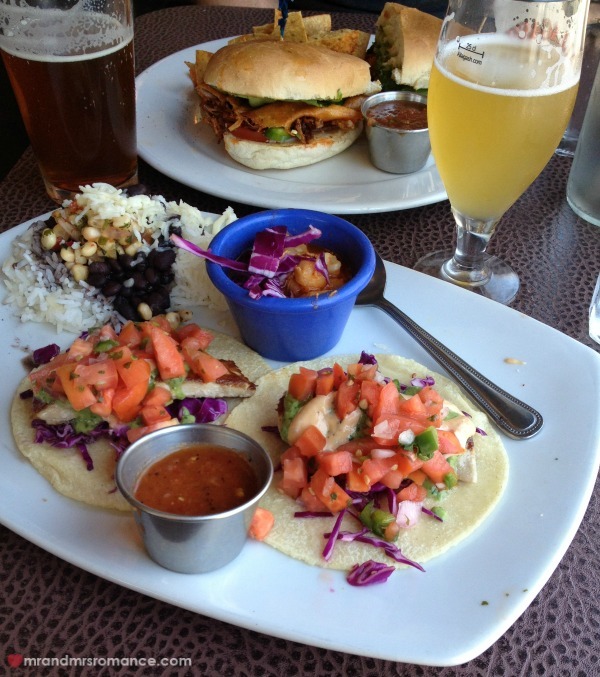 After exploring the Magnificent Mile and the Chicago River for an hour or two, we were in need of beer and food. Well, I was anyway. Thanks to Yelp! we discovered The Plymouth Rooftop Bar. We liked the views, we liked the beer and when they brought us out these crispy spicy little strips of heaven, we decided we liked the food too! This last spot was a tough call. 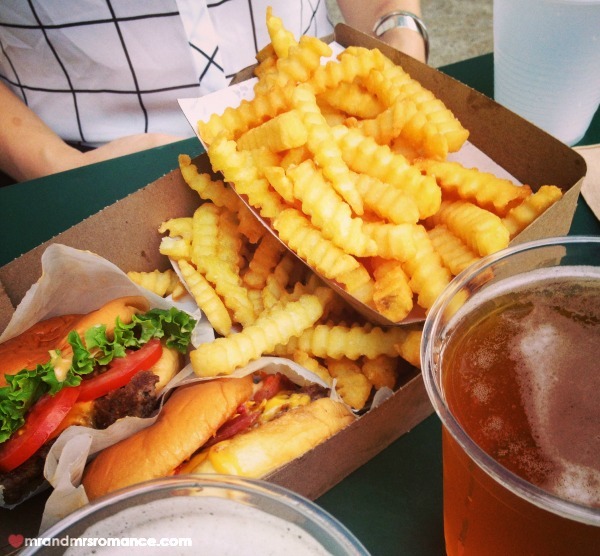 It was between Shake Shack, The Spotted Pig’s burger and Whitman’s Juicy Lucy filled burger. In the end, Shake Shack won purely because of its location. The one we tried was right in Madison Square Park facing my favourite building – the Flatiron. 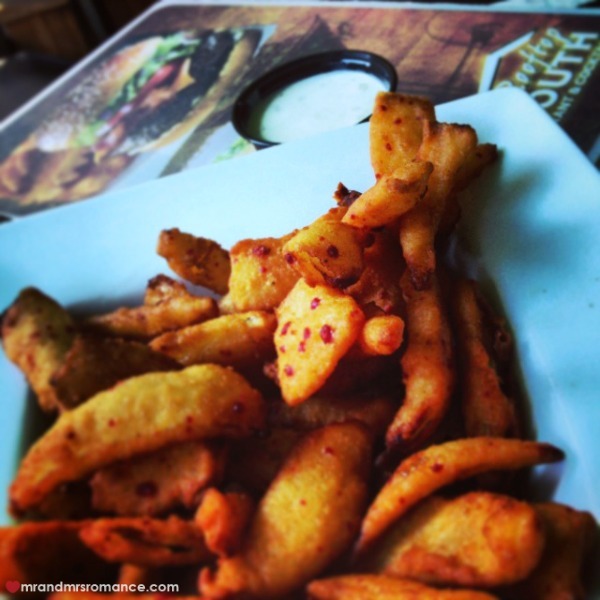 The queues are substantial but the burgers come with crinkle cut chips, so it’s a trade-off! If you want to see what we’ve got to say about the Spotted Pig and Whitman’s, here’s our East Side vs West Side Burger off! 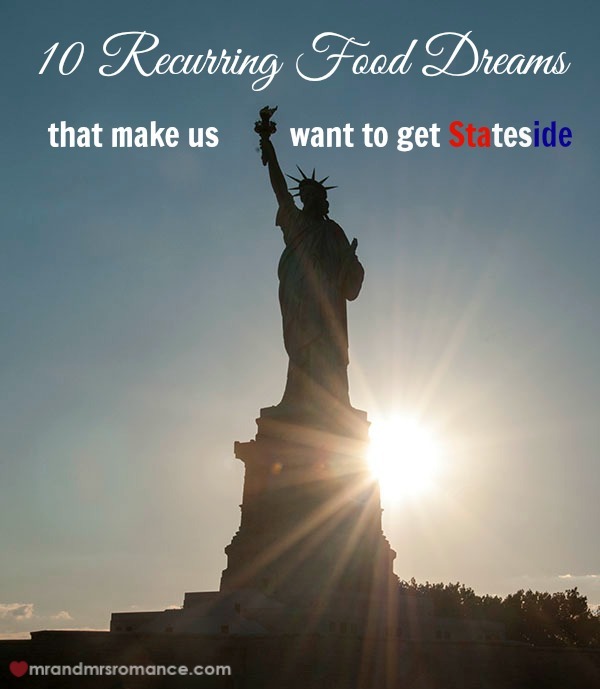 Do you have any recurring food dreams that make you want to pack your bags and fly back to that plate? Tell us in the comments! We’re going to the States in a couple of months. We’ll only be there for a couple of weeks and I’m starting to worry that there won’t be enough time to fulfil all our food fantasies while we are there. We’ll be in Chicago so we may well be following in your footsteps!